Microsoft has made tremendous strides getting Hyper-V adopted by enterprise datacenters. Since its early days, Hyper-V has greatly matured into a fully-featured and robust hypervisor that is gaining much trust in the industry. They certainly had some ground to make up, given popularity of major competitors such as VMware, who have remained a dominant force in the industry. However, with strong adoption numbers and some well-developed features in Windows Server 2016, Hyper-V is now a proven platform that many are using to for their virtual infrastructure architecture. As with any server technology, you must consider your disaster recovery strategy and how it integrates with your infrastructure. The days of streaming backup data from within guest operating systems by means of a backup agent are over. Today’s modern enterprise infrastructure is mostly virtualized, meaning we have literally hundreds of guest operating systems running on a few physical Hyper-V nodes in a cluster configuration. Trying to manage backups efficiently and effectively from every single guest operating system by means of an agent would be a management and administrative nightmare. While there may be a corner use case for employing guest-level backups on a few VMs for one reason or another, generally, backing up VMs at the host level is the best way to back up Hyper-V infrastructure. Using backup software that can interface with your Hyper-V hosts allows you to use a single entry point to back up multiple VMs. Additionally, it’s hugely beneficial if your backup software can back up Hyper-V virtual machines at the host level in that your backup will contain all the VM-specific settings and configuration. Restoring a host-level backup of a VM will recreate the virtual machine down to the very last detail, including the VM settings themselves. Guest-level backups have no knowledge of the Hyper-V infrastructure housing the VMs. This means that if you need to restore the entire VM from a guest-level backup, you would first have to create a “shell” VM to receive the restored data from the original VM. This would require manually re-establishing the virtual machine settings. 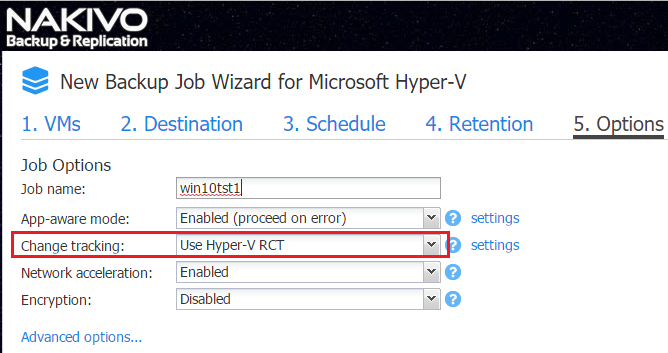 When thinking about the best way to back up Hyper-V virtual machines, you should make sure you take advantage of Hyper-V’s Resilient Change Tracking, or RST. What is RST? This technology is new with Windows Server 2016 Hyper-V and allows us to perform true incremental backups. Resilient Change Tracking is Microsoft’s implementation of Changed Block Tracking (CBT) for Hyper-V. In short, this Hyper-V technology allows modern VM backup software to keep a mapping of blocks that have changed since the last backup. Download our White Paper and learn about 21 reasons why modern native backup solutions are better than legacy backup software. You first create a full backup of your Hyper-V virtual machine, then instead of having to copy down the same data with each backup cycle, the backup software only copies the data that has changed. With RST turned on, the next incremental backup knows by the “virtual block” tracking which blocks have changed and only copies those blocks. Between the full backup and each incremental backup with the changed blocks, you have a complete representation of the Hyper-V virtual machine. The resilient component of the RST acronym highlights Hyper-V’s ability to maintain consistency in the change block tracking process, even if you suffer a hard crash or the unexpected shutdown of a virtual machine. Using a total of three changed tracking files, with one in memory and two on disk, spreads this information out across multiple locations and media so we have redundancy in the RST information. NAKIVO Backup & Replication is a modern VM backup solution that can easily back up Hyper-V environments and makes use of Hyper-V’s RST. The Best Free VM backup for Hyper-V! Download now! 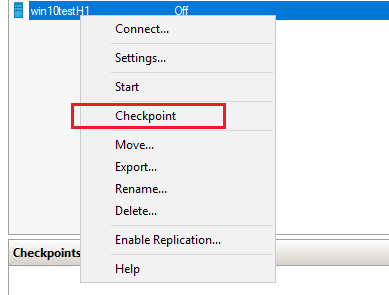 Checkpoints are Hyper-V’s term for what many in the VMware world would refer to as snapshots. Many have had to learn the hard way how checkpoints/snapshots of virtual machines work. These are not backups and are not supported by Microsoft in Hyper-V as such. Checkpoints employ a mechanism to record delta changes from a point in time. However, they are dependent on the base disks they are created from. A backup should be a completely autonomous mechanism to restore data and have no dependencies on its parent VM disks. Checkpoints/snapshots utilize files that reside on the same underlying storage infrastructure and in the same VM folder as the parent virtual machine disks. If we lose the parent disk, the checkpoint is unusable. Checkpoints have their place, especially in situations where quick rollbacks to a known state are needed. A specific use case for checkpoints would be in a development scenario, where a developer needs to roll in code and continue the testing process. A checkpoint would allow rolling a server back to a state before the code was rolled in, and then reverting through each iteration of testing. The key point here however, is that checkpoints have a purpose, but that it does not encompass functioning as a form of backup. Thus, the best way to back up Hyper-V VMs is to always keep in mind that Hyper-V checkpoints cannot be used instead of backups. Hyper-V’s Integration Services is a set of “VM tools” used in the Hyper-V world, which allows special interaction between the Hyper-V host and the guest operating systems loaded on Hyper-V virtual machines. This special bundled set of software installed on the VM is especially relevant when it comes to finding the best way to back up Hyper-V systems. One of the Integration Services that is installed is called Backup (volume checkpoint). This service enables backups of the guest operating system that are consistent when leveraged by a VM backup solution that can take advantage of the Integration Services capabilities. Making sure the Integration Services bundle is installed, enabled, and running allows backups of the VM that are from the host and are live with zero downtime. Leveraging Hyper-V’s Integration Services means backups can utilize checkpoints and VSS to back up data consistently without disruption. Without Integration Services, VMs that are backed up are placed in Saved State while the VSS snapshot is taken. In Saved State mode, some Hyper-V virtual machines may go offline briefly during the initial backup process. Backing up business-critical resources generally includes applications such as Microsoft Exchange Server, Microsoft Active Directory, and Microsoft SQL Server. The aforementioned applications are generally found in most of today’s enterprise datacenters. When backing up virtual resources that contain applications, it is important to make sure those VMs are backed up using “application-aware” backups. Application-aware backups utilize the Microsoft Volume Shadow Copy service to make sure application transactions living in memory are properly flushed to disk before the backup is taken. This ensures the applications, and specifically, their databases, are left in a transactionally consistent state. There are major advantages to using application-aware backups and transactional consistency. It eliminates the risk of data corruption. It also ensures there is no additional process to perform after the backup is restored. If you were only restoring a “crash-consistent” backup or one that was unaware of the application data, you would need to follow additional processes to replay logs and carry out other tasks to ensure the database-driven application is consistent. When minutes count in a disaster recovery scenario, having a restored backup that is already consistent definitely fast-tracks your RTO time. 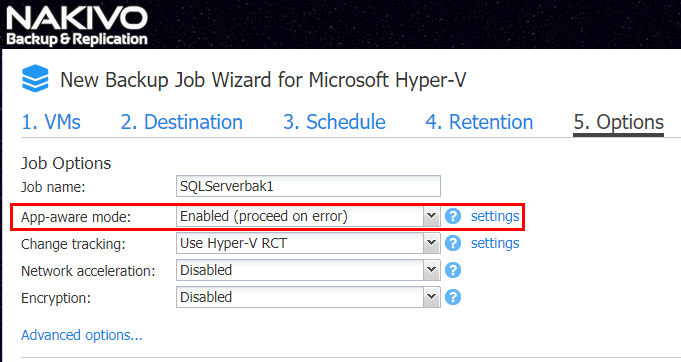 Specialized software like NAKIVO Backup & Replication allows you to use the App-aware mode for Hyper-V jobs to make sure you are application-consistent when backing up your business-critical applications, which is the best way to back up a Hyper-V environment. Organizations today have a number of different options when it comes to choosing a hypervisor for their virtual infrastructure, and many datacenters are choosing Microsoft’s Hyper-V. Hyper-V has matured with Windows Server 2016 and now offers powerful features/functionality. When it comes to data protection of Hyper-V environments, you should find the best way to back up your Hyper-V virtual machines. You can start with our ready-to-use checklist, which includes backing up VMs at the host level, using Resilient Change Tracking, not treating checkpoints as backups, making sure Integration Services are installed and functioning, and taking advantage of application-aware backups. NAKIVO Backup & Replication has you covered in all areas of Hyper-V backup best practices, including the aforementioned checklist. Using the product, you will be able to back up your Hyper-V VMs efficiently, safely, and reliably. Download the full-featured Free Trial of NAKIVO Backup & Replication or request a Live Demonstration.